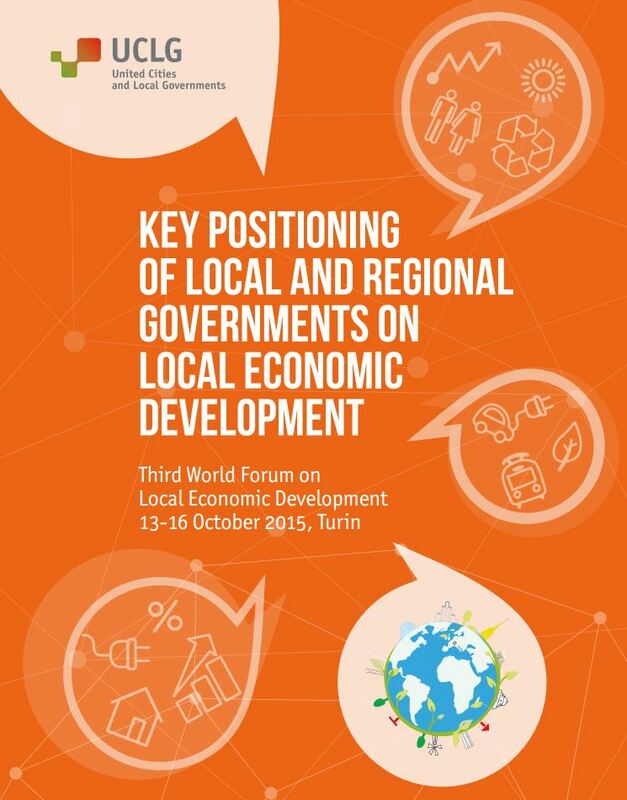 Local is human, local is efficient, local is beautiful – these were key messages of Pope Francis in the opening ceremony of the 3rd World Forum of Local Economic Development (LED), which took place between 13 and 16 October in Turin, Italy. Hosted by Mayor Piero Fassino, the Forum gathered 2,000 participants from over 100 countries, including a delegation of around 200 members of our World Organization. With a rich agenda, including three plenary sessions, 30 panels and 26 workshops, the event evidenced the power of the local level in economic development through the hundreds of experiences, practices and statements shared by participants. The general theme that global objectives can only be achieved if the focus is local and a bottom-up approach to implementation is adopted was expressed by the Secretary General of the United Nations, Ban Ki-Moon, in his keynote speech: “The SDGs will only be achieved when countries and communities work together, becoming one big city. Local environments are central to the success of the SDGs. It is important that global goals are developed in cites, regions and territories.” He further called on mayors to reach out to citizens and ensure their participation in this process. Widely represented in the Forum, the UCLG delegation included Vice President Mpho Moruakgomo, the Mayors of Dakar, Chefchaouen, Matola, Maputo, Belo Horizonte, Tunis, Bethlehem, Las Cabezas de San Juan and the Governor of Santa Fe, as well as the Secretary General of UCLG Africa and representatives from the World Secretariat, the Committee on Urban Strategic Planning, and the Working Groups on Intermediary Cities and LED, as well as our partners FAMSI, FMDV, ORU‑FOGAR and CNM. Opening the Forum on behalf of UCLG, Khalifa Sall, Mayor of Dakar, stressed the importance of “thinking global and acting local” and emphasized the need for human‑centred development. Following the discourse of the Mayor of Turin on how LED has enabled the city to transform its industrial roots to become the diverse, cultural and innovative city it is today, he urged local authorities to take responsibility for their own development, expressing the view that “Africa is the driver of future development”. Echoing the sentiments of the UN Secretary General, speaking in the plenary session on LED as an effective approach to reduce inequality, Antonio Bonfatti, Governor of Santa Fe characterized decentralization as “the leaven of development”, where a strong call to take producers, in particular small farmers, and micro-business into account in LED policies was expressed. This view of the effectiveness of the small-scale urban economy was evidenced by Marcio Lacerda, Mayor of Belo Horizonte and President of the FNP, stating that there are now 300,000 SMEs in Belo Horizonte that are contributing to the city’s development. The need to effectively capture tax revenues as a key means of financing LED was also raised. The potential of LED to provide a meaningful framework for conveying and integrating the key actors and dimensions associated with the effective implementation of the SDGs at the local level was also discussed, with Lenni Montiel, Assistant Secretary-General of the UN for Economic Development, emphasizing “all SDGs relate to territories”. The achievements of the Global Taskforce during the Post-2015 Development Agenda negotiations were recalled by panellists, who underscored the need for nations to express clearer policies on LED that include associations of local governments. Secretary General of UCLG Africa, Jean‑Pierre Elong Mbassi, stressed that LED will only work if international organizations such as the UN work directly with those on the front line, adding that “there will be no development if it is not carried out at local level”. 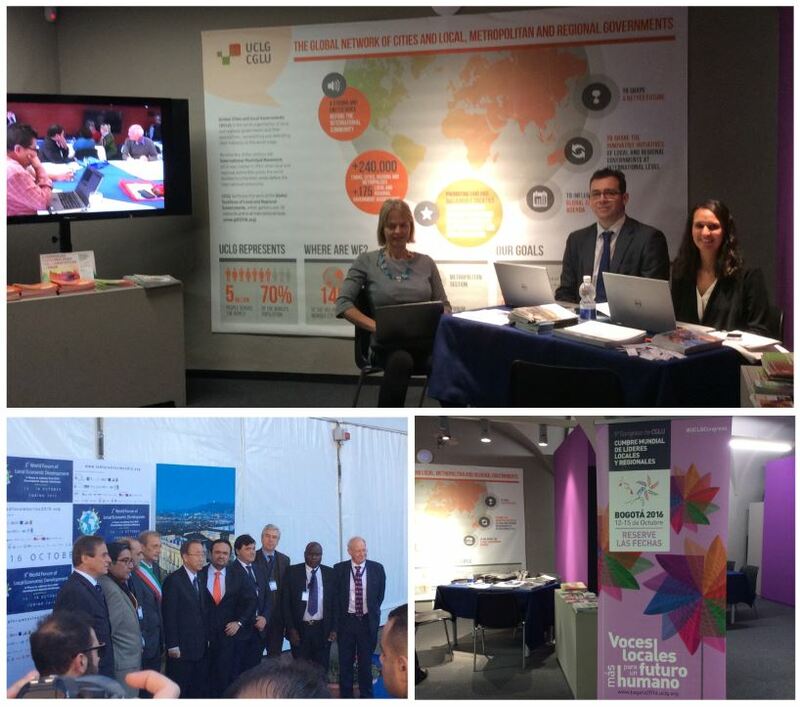 Cooperation and partnerships were also key themes running through the sessions. The Mayor of Matola, Calisto Cossa, stressed the importance of finding joint solutions between all actors, and stated that “triangular cooperation and the education of women are essential for cities and nations to grow”. The Mayor of Chefchaouen and Chair of the Working Group on Intermediary Cities, Mohamed Sefiani, stressed the value of South-South cooperation projects carried out with UCLG and the ILO, and provided examples of urban realities in LED such as local policies and cooperatives involving farmers and consumers; proving that partnerships work best when they focus on local priorities set by the communities. The crucial role that intermediary cities play in bridging the gaps between metropolitan centres and rural zones was also recalled. UCLG Vice President, Mpho Moruakgomo further stressed the need to create partnerships, including PPPs, to reduce dependence on the State, and since “all partnerships create synergies, generate skills and enable knowledge transfer”. The Forum also provided a great opportunity to launch the organization’s new key positioning document on LED, based on policy inputs from the UCLG Working Group, presided by FAMSI and FCM. The publication expresses key messages such as the crucial role of local authorities in leading development in territories, creating employment and fostering urban‑rural linkages, and the need to strengthen the capacities of the local level and recognize the importance of urban planning strategies in order to do this. Focusing on a key area of the organization’s agenda, the Urban Strategic Planning Committee and UN-Habitat organized a panel session dedicated to opportunities for LED through effective public space policies, showcasing a range of perspectives related to the social, cultural and economic benefits of public space, markets, job creation and the informal economy, logistics and mobility, protected land and citizen participation. Interventions from the floor also touched on the links between gender and dignity in public space policies and the right to the city. UCLG also coordinated an interactive peer learning activity looking at migration in Turin and its role in local development from economic, social and territorial points of view. This was implemented through a tour of the Porta Palazzo market, the largest open market in Europe, led by migrant guides trained through the project "MygranTour”. The tour gathered over 50 participants, including many technical and political representatives of municipalities from around the world, who observed first-hand how economic activity was a key factor of integration and inclusion. Metropolis and FMDV also led a session on re-localizing economy and finance for local sustainable development, and UCLG Africa held a workshop to exchange regional experiences on the challenges and prospects of LED in Africa. An opportunity to bring together a range of actors, the three days of intensive discussions helped to nurture the partnership between UCLG and various UN agencies; with the ILO praising the increased recognition of local authorities within the UN since Habitat II and calling for increased capacities and support, and UNDP raising the importance of partnerships between the UN and the local level. The European Directorate General for Development Cooperation also emphasized the many steps they have taken to recognize and support local authorities, including their role as their largest donor, with 1.7 billion funding provided to regional and local governments. Rosario Bento Pais, Head of Unit for Local Authorities and Civil Society, said that peer‑to‑peer and other forms of cooperation were crucial to implement LED, which must be managed by a territorial approach. In addition to congratulating the great success of the Forum, the closing ceremony reflected on the steps ahead to attain the desired results and implement effective LED policies, especially with a view to achieving the recently adopted Sustainable Development Goals and the 2030 Agenda. Representing UCLG, Francisco Toajas Mellado, Mayor of Las Cabezas de San Juan and Chair of the Working Group on LED, recalled the challenges that all mayors, both in the north and south, face in terms of providing their citizens with a strong local economy and decent jobs, and the importance of implementing the SDGs at the local level to drive economic development. According to Giovanni Camilleri from UNDP ART, in order to do this, each country must contribute their own efforts and resources to the implementation and monitoring of the SDGs, up to 3% of their GDP. To conclude the event, the key outcomes of the Forum were summed up in the Final Declaration, presented by the Vice Mayor of Turin, Enzo Lavolta.